‘Hiding in plain sight’ is a phrase often used in architectural heritage where the actual significance of a building or place is not revealed by its surface appearance. 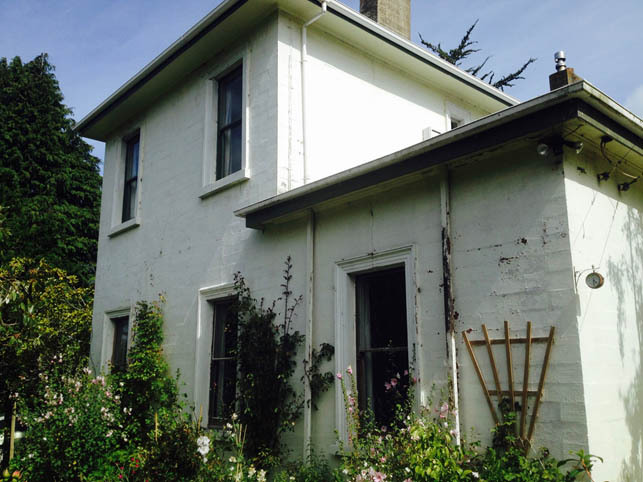 So it is with Allan Grange, a villa in the suburb of Bradford in Dunedin’s Kaikorai Valley. 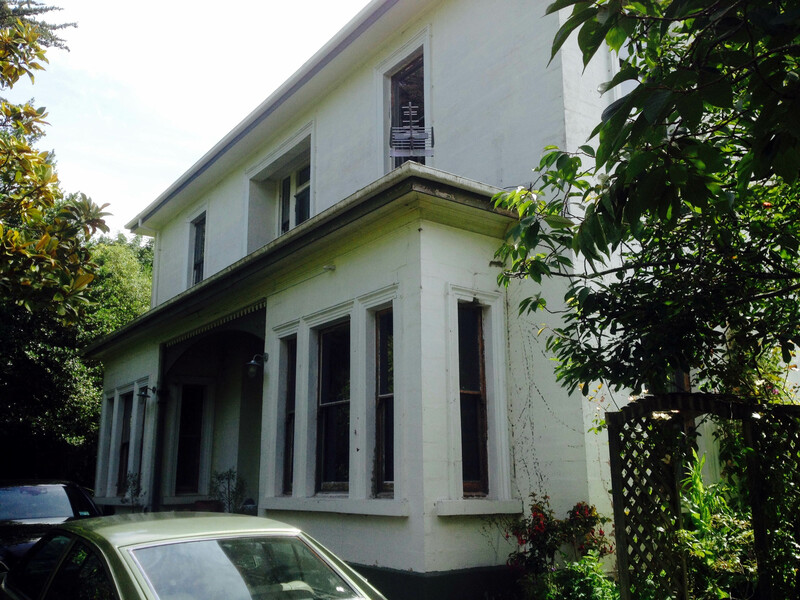 This two-storey house stands in Glenelg Street, still surrounded by a woodland garden. It is now thought to be the first house constructed of hollow cement block in New Zealand and a close contemporary of the first houses of their type in North America. How it happened is still a bit of a puzzle. The owner of Allan Grange, Thomas Mackenzie (1853–1930) was an important national figure, representing Clutha in parliament from 1887. He was dispatched to London by the Government as trade commissioner in 1889 and played a major role in promoting local exports, particularly frozen lamb, wool and grain. He returned to Dunedin in 1899 and stood for election in the Waihemo electorate, becoming Minister of Agriculture in 1900 and also Minister of Tourism and Postmaster General. He was Prime Minister briefly in 1912 after the resignation of Sir Joseph Ward, when he returned to London to reprise his earlier role as New Zealand High Commissioner. Somehow Mackenzie also found time for the mayoralty of Roslyn between 1901 and 1905. The history presented to the recent purchasers of the house was that it was built in 1872 and made from Portland stone concrete blocks imported as ships’ ballast, showing how stories around houses often contain facts and speculation mixed together. 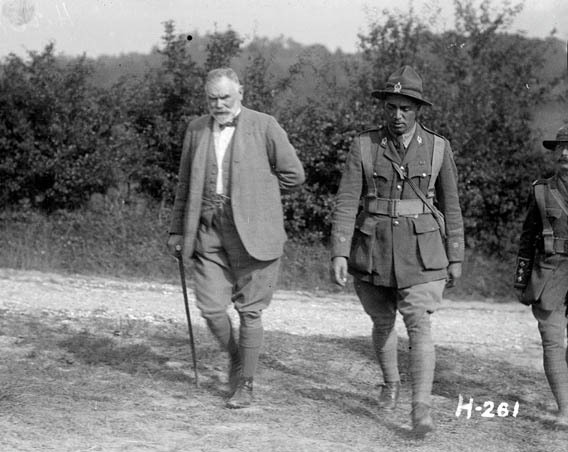 Sir Thomas Mackenzie and Peter Henry Buck, in France, during World War I. Ref: Alexander Turnbull Library 1/2-037933-F. Between his numerous commercial and political activities, Mackenzie developed his seven-acre estate in Kaikorai Valley. Council details are scant but in 1899 he likely engaged the Jensen Patent Construction Company to build a house on the property. The business was set up late in 1898 to exploit patents for Monier construction, a technology pioneered in France for wire reinforced concrete. Its founder was a Danish engineer named Vilhelm Alfred Langevad (or Langevod) who held the patents for ‘Improved Monier System of Construction by Emanuel Jansen’ covering cement products in his home country. Local patent applications were lodged in Wellington in 1899 for constructing floors and manufacturing concrete pipes under the title of ‘E. Jensen’. While in Wellington Langevad made contact with Milburn Lime and Cement Company manager Frank Oakden who had recently returned from a business trip to England and Northern Europe. While overseas, Oakden had purchased new equipment for the Dunedin plant and the patent rights to ‘Silica Portland Cement’ developed by Danish cement chemists and then coming into wide use in Europe and North America. The manufacture of Portland cement was crucial to the New Zealand economy in the 1890s and a number of competing companies sought to dominate the local trade. During the 1890s, with a view to taking as much as it could of the Australasian market, Milburn invested heavily in new equipment. The company was the first in New Zealand to introduce modern rotary kilns and tube grinding mills to produce Portland cement it warranted was superior to all imported brands. Its products were widely promoted to architects and civil engineers keen to exploit the properties of steel reinforced concrete construction. In the Milburn company minutes for 1898 it was reported that ‘After conferring with Mr Langevod (sic) we agreed to float a separate company, The Milburn Company taking in hand the formation and if our shareholders support it, subsequently retaining the control to that end the prospectus is prepared…I am well satisfied with Mr Langevod’s ability to manage the concern and have no doubt it will be successful if floated.’ Investors included J.M. Ritchie of the National Mortgage & Agency Co., Dr T.M. Hocken, Bendix Hallenstein and Frank Oakden himself. Oakden had earlier advised the Milburn board that ‘I think it advisable to prevent others so far as possible from becoming interested in the Cement trade. Monier Construction might be the first step to opposition’. The arrangement was beneficial to both parties. The Milburn company could promote its new silica portland cement through built projects while Langevad could operate a modern factory to produce his precast products. The hands off arrangement enabled Milburn to enhance its reputation if the ventures were successful or make a quick exit if not. The Jensen Patent Construction Company was granted a year-long lease on a piece of land next to the Milburn plant in 1899 and set up its new factory with funds from the share float. Backed up by £10,000 in shares, it began seeking construction projects. Few tenders for buildings specifically mentioned concrete and it appears that the Jensen company answered those for masonry structures and used their cast hollow blocks instead of more usual brick or poured solid concrete. The Milburn Lime and Cement works at the bottom of Frederick Street prior to reclamation of Pelichet Bay. Detail from W.J. Prictor plan. Ref: Alexander Turnbull Library MapColl 834.5292ap 1898. The precise source of the block moulding system used by Langevad remains obscure but it is not likely to have been part of the raft of patents secured by Harmon S. Palmer of Chattanooga in 1899 and usually given as ‘the start of modern concrete blocks’. There was a boom in this manufacturing method after 1900 and numerous hollow concrete block makers flooded the international market after 1906. The block module used for Allan Grange measures 6 X 9 X 18 inches which suggests an American rather than European origin for the moulds, although Nigeria is one of the only places in the world where blocks of these dimensions are used today. It took until 1924 for the 8 X 8 X 16 block to become standardised and until then numerous variations were tried. A fellow Dane, Niels Nielson, sought to make hollow blocks in Wellington using a Palmer machine under the title Wellington Hollow Concrete Building Block Company. Nielson built a warehouse and a group of houses at Lyall Bay in 1904, reckoned by Nigel Isaacs to be the earliest in New Zealand. This places Allan Grange in an intriguing position, some way ahead of the boom that launched hundreds of competing patent systems in the first decade of the twentieth century. Hercules Concrete Block Machine catalogue, Rochester, New York, 1907. A typical promotional sheet for one of the great number of North American manufacturers that came into existence after 1900. One of the main issues with new construction technology is confidence that the system will not fail in use. Local papers were full of bullish promotion of new cement systems including MIlburn with its Silica Portland Cement. 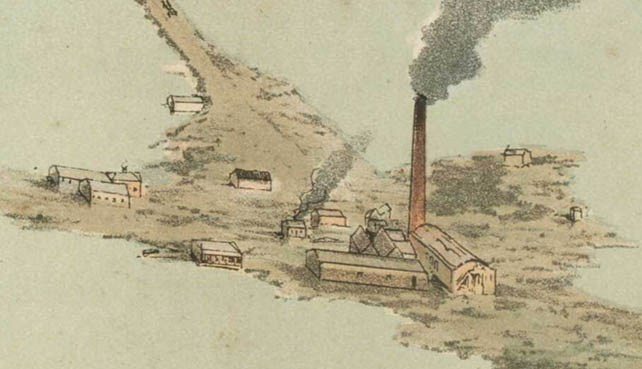 Despite opening the plant up for viewing by local architects and engineers and undertaking comprehensive tests of the products, uptake of the new system was modest, at least in terms of the size of Milburn’s expenses on the patents and the re-equipping of their cement works. It was hard going for the Jensen Patent Construction Company as well. It was reported in 1899 that the company was working on a row of shops on the old Queen’s Theatre site in Princes Street and a studio for the artist James Elder Moultray on Frederick Street, near where the Queen Mary Maternity Hospital was later built. The description of the process is mirrored in the construction of Mackenzie’s house and it is likely that Allan Grange was built immediately after Lorie’s store and Moultray’s studio. Mackenzie took up residence at Allan Grange early in 1900, using the address on his voluminous correspondence from March that year. Allan Grange in 2017.Michael Findlay photo. Allan Grange was a two-storey gentleman’s farmhouse. It was relatively conventional in appearance with a pair of symmetrical bay windows with a terrace and a recessed sun porch in the centre above. A single-storey wing extended to the rear and the style was simplified Italian. Recent close inspection of the walls showed an unconventional block shape with tuck pointed joints and free blocks used around the contemporary garden as edging clearly showed their hollow form. This did not tally with the supposed construction date of the house of 1872 when hollow block construction was hardly known in the wider world, much less New Zealand. Even so, a construction date of 1899 pushes the house to the front of international developments. The first concrete block houses in America were constructed using related technologies, possibly as early as 1885. Amongst the earliest uses of hollow cement block is a group of seven houses built in that year by the Union Stone and Building Company in Minneapolis. These, as well as an eleven-unit terrace, remain as examples of the very early use of concrete block in North America. Nigel Isaacs notes that a group of houses constructed in 1897 marked a turning point in the technology, observing that ‘It was not until Harmon S. Palmer had experimented for ten years, including building six houses in Chicago in 1897, that he brought together manufacturing and design concepts that led to the creation of the modern hollow concrete block’. The designer of Allan Grange remains a mystery. Unlike Jensen’s other documented projects no similar newspaper coverage appeared for the construction. A single tender can be found for an architect-designed house in Kaikorai between 1899 and 1900, issued by James Hislop in January 1899. Mackenzie had not returned to Dunedin then so it is unlikely to be for Allan Grange. When James Burnside issued his tender notice for Moultray’s studio it was for a ‘studio in brick’ so it is still possible that a tender was issued for a ‘house in brick’ and it remains to be found. It is possible that an architect was not needed. Vilhelm Langevad was a qualified civil engineer and was clearly able to design and manage civil and industrial projects so a house is certainly within his powers. Mackenzie had previously been a surveyor and equally capable of drawing the house for the Jensen Patent Construction Company to build. The planning and aesthetics do not greatly reflect contemporary architectural thinking so either of these scenarios could explain both the idiosyncratic design and the lack of any tender information in the local newspapers. This hiatus leaves a number of unanswered questions about how Allan Grange came to be built. It is an assumption that the Jensen Patent Construction Company supplied the blocks but all available evidence points to this conclusion. The lack of any documentation for the project can be put down to the voluntary liquidation of the Jensen Company in 1902 and the Milburn Lime and Cement Company quickly moving on to other forms of hollow block technology. A complex court action over a bridge construction tender possibly hastened their downfall but it is more likely that the company simply failed to make money and its investors wanted out. This was typical in the hard driving cement industry where commercial survival involved both intensive investment in plant and swift U-turns if things did not go well. The closure of the company did not end Langevad’s involvement with Dunedin. He joined the City Council as assistant engineer and later worked as a building inspector. He relocated to New South Wales and managed the design and construction of major cement works in Kandos under the supervision of Frank Oakden. Thomas Evans bought the Jensen equipment and production of Monier concrete pipes began again in Masterton in 1904 under the Cement Pipe Company. The long survival of Allan Grange, a few cracks notwithstanding, points towards the Jensen Patent Construction Company’s early efforts to pioneer hollow concrete block construction in New Zealand and operate at the very edge of this technology in the world. Note: One of the jewels in the Hocken Pictures Collection is ‘Portrait of Vivien Oakden’ c.1898 by Grace Joel. Also noteworthy is Alfred Cook’s beautiful 1924 watercolour of Lake Logan showing the cement works, held at Toitū Otago Settlers Museum. Otago Daily Times 14 February 1930 (obituary), 8 June 1899 (Otago Agricultural and Pastoral Society),18 September 1889, 25 September 1897 (Milburn Lime and Cement Company Ltd); Chronicle (Adelaide) 3 October 1940 (Mr V.A. Langevad); Evening Star 2 April 1898 (Otago Jubilee Industrial Exhibition); Otago Witness 21 February 1912 p.41 (advertisements), 28 December 1899 (City Improvements). Hall, James P. The Early Developmental History of Concrete Block in America. Masters Thesis, Ball State University, Muncie, Indiana, 2009. Notes on the Manufacture, Testing, Uses, etc. of Portland Cement. Milburn Lime and Cement Company 1895. H-10 Patents, Designs, and Trade Marks. Tenth Annual Report of the Registrar. Untitled, 1 January 1899 (Hughes, W.E., Wellington NZ. Constructing Floors (E. Jensen) 11156 14 November 1898, Hughes, W.E., Wellington NZ. Manufacturing Concrete Pipes (E. Jensen) 1116315 November 1898. Lesley, Robert Whitman, John Baptiste Lober and George S. Bartlett. History of the Portland Cement Industry in the United States. Chicago: International Trade Press, 1924. Jensen Patent Construction Company files, Archives New Zealand R1930690. Milburn Lime and Cement Company Limited: Records. Hocken Collections AG-158. This entry was posted in Buildings and tagged 1890s, 1900s, Cement, concrete, Construction, Kaikorai, Langevad, Milburn Lime & Cement, Roslyn, Sir Thomas Mackenzie on 9 January 2017 by David Murray.